Kyoto station is the hub for all transport in Kyoto. It’s also a major shopping district and there’s restaurants to satisfy every taste and budget. This post is one of a series that make up a self guided walking tour through eastern Kyoto. The full route is around 10 km from Kyoto station to Ginkakuji, the silver temple in the north. Make a day of it or select only the sections that appeal the most. We’re starting in the Kyoto station area because it’s the transport hub of the city, the location of large shopping and eating precincts, accommodation and it’s an interesting destination in its own right. If you want to follow along on our self guided walking route of Eastern Kyoto take a look at the Walking Kyoto article. 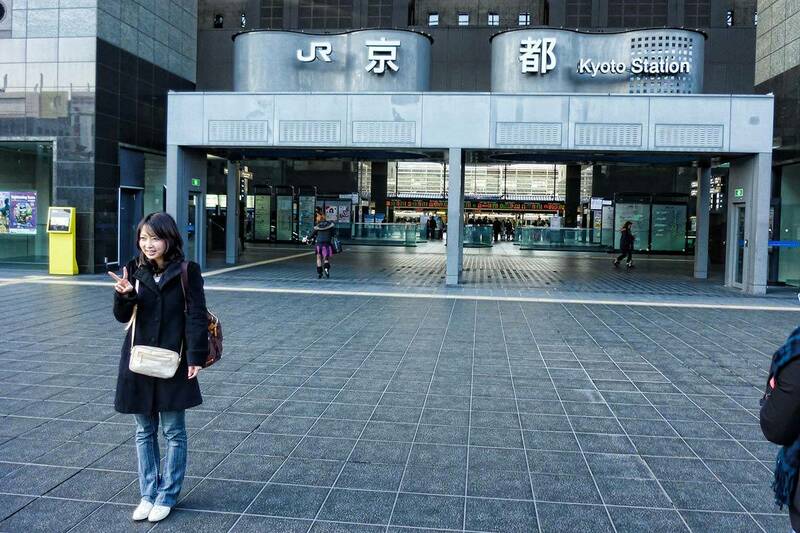 In this post we focus more on the Kyoto station layout and what there is to do in the immediate area. Kyoto station is the transport hub for the city, it’s very likely that it will be the first glimpse of Kyoto for most visitors. 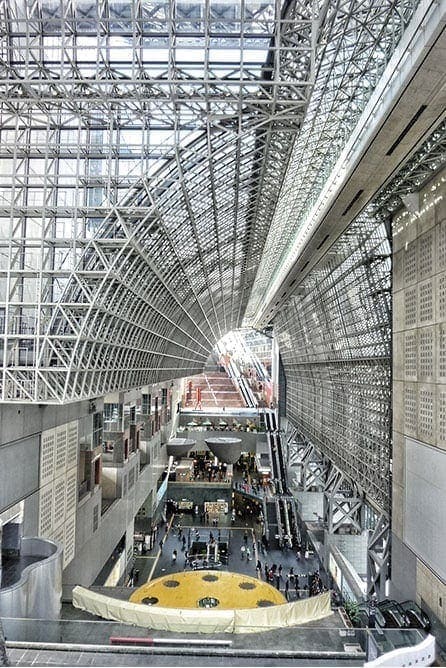 The closest Airport to Kyoto is the Kansai Airport in Osaka so if you’re visiting you will most likely arrive by Shinkansen (Bullet Train), Train, Subway or Bus into this transport hub known as Kyoto Station. We always buy the Japan Rail Pass to get around the country so we use a lot of Shinkansen and Limited Express Trains. I prefer Kyoto to Osaka as a hub for several reasons but one of them is having the central train station, subway, bus and the Shinkansen station in the same place is a lot more convenient. We have shared before our top 10 day trips from Kyoto and you can access all of them from here. Kyoto train station is dramatic. When the current station was built to commemorate the 1200th anniversary of Kyoto in 1997 it polarized opinion. Some felt the futuristic styling didn’t reflect the tradition and culture of the city. Fortunately the station and the high rise developments that followed haven’t over-powered or detracted from Kyoto. As the second largest station in Japan it is certainly a busy hub for transport and daily life for the city’s many commuters. The architect, Hara Hiroshi, incorporated aspects of Kyoto in the design. In this main entrance hall known as the Matrix for example the ceiling pattern reflects Kyotos grid-like street layout. The station is the hub for shinkansen (bullet train), JR and local trains, the subway and buses. Making it super convenient for coming and going to just about anywhere including a super quick train to Osaka Airport. Inside the station if you go up the escalators one level there’s an information desk where you can pick up English walking maps. It’s definitely worth having a hard copy map in your bag, even if you have trouble following it, it will help others point you in the right direction if you need it. 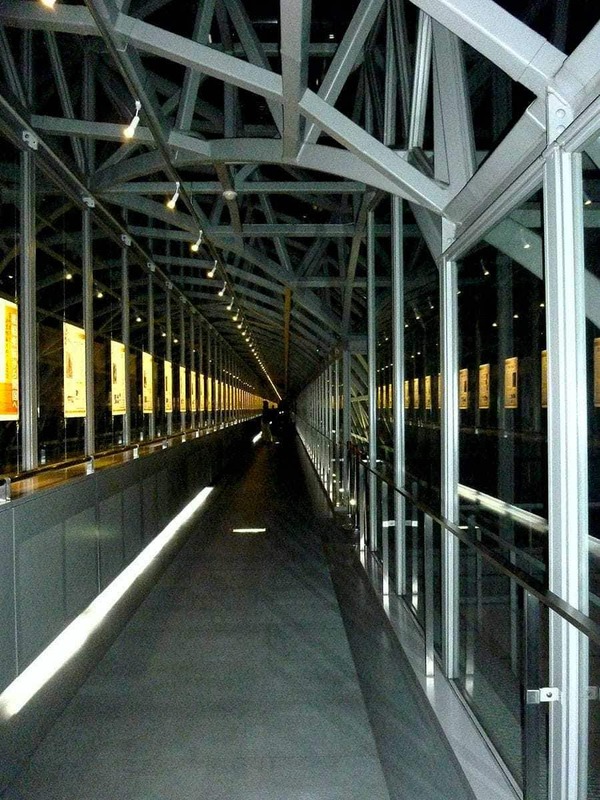 Ride the escalators, climb the stairs walk through the suspended glass tunnel to look down on the station below. You really do want to look at this place from all sides. Outside the main entrance you will see a fountain, in the evening there is a light show to music there and inside on the wide stairs alongside the escalators they often have a light display playing on the stairs. From the second top restaurant layer of the Matrix you can access a walkway that leads across the building with views down to the escalators and ground below. There’s also an open sky garden on the top level which lets you look out both sides. It’s through a screen though so not particularly good for photography. 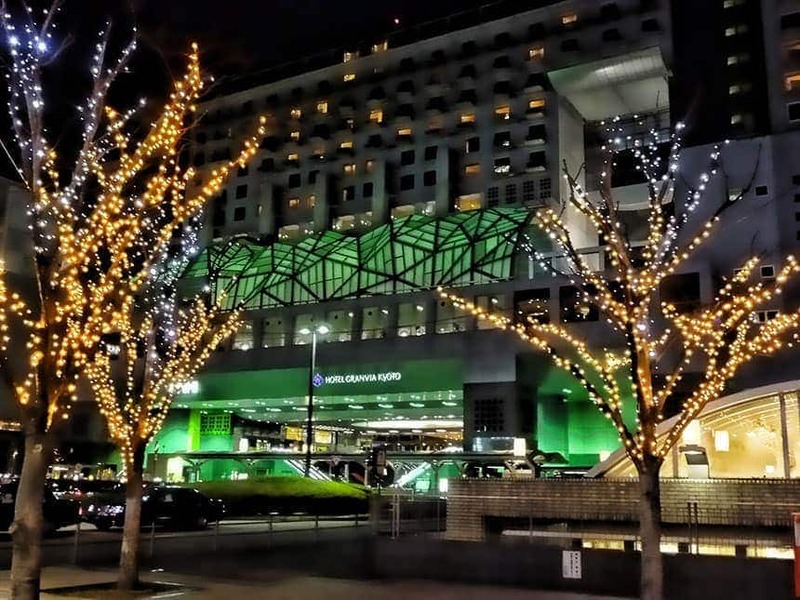 There are a number of reasons why we often choose a Kyoto Station hotel. If you are arriving in the evening as many flights do you don’t need to hassle with transfers and can check-in and get on with exploring. I also factor in that staying nearby saves me a taxi fare with luggage to and from the station as that is the only time we tend to use taxis, otherwise we walk or take public transport. If you do day trips as we do, either to nearby cities or slightly further afield within Kyoto there’s the convenience of being right at the transport hub and not wasting time getting to and from it daily especially if you have an early start or late return. I have to admit that I love the Hotel Granvia, it’s located right inside Kyoto station. We’ve stayed here several times now and the rooms are a good size, immaculately clean and well presented. While it’s super convenient being located well there’s not a peep of train or station noise inside the room. Because it’s very popular it’s not the cheapest option but I still justify it on the basis that internet is included, we don’t need a taxi to and from the station and general convenience. There’s usually a heap going on in the station area. There are two huge shopping areas and restaurants at all price points. For a start ride the escalators to the 11th floor, there is another level above you that’s worth heading up to for the views but you want this level for the to the left for The Cube gourmet street restaurants, we’ve tried many of these over different trips and they have all be good. There’s an excellent tempura restaurant here that we’ve been to a couple of times. Tempura here is a bit of an art so it’s not a budget meal but well worth the splurge to have it done really well. Turn the other way and go through into the Isetan ‘Eat Paradise’ restaurants, again some great options through here. Take the escalator down to level 10 and you will find the Kyoto Ramen Hall, a set of 8 shops representing different ramen styles from around the country. A good quick and budget option, you can have the chance to try the ramen vending machines here if you are after a different experience, you make your selections on the machine and pay then collect your meal, if you don’t read Japanese it can be an interesting mystery meal. From the ground level you can access the Porta shopping centre which has many restaurants too. Go down the subway stairs just outside the main station entrance to access the shopping centre, you can also access the subway from down here. Most of the restaurants here will have displays of plastic food in the window, these are really well done and help with narrowing down the huge choice if you can’t read the menus. There are Okonomiyaki, noodle and other restaurants down here that we regularly use if we’ve arrived back late from a day out and want something tasty for dinner without going into town. Head up the escalators on the other side of Kyoto station and you will come to the Hotel Granvia as mentioned above. There are another 11 cafes and restaurants in here that are open to guests and the public. Still looking? There are more small eateries inside the station itself on the platform side of the ticket gate around the Shinkansen side of the station, these are generally more casual for a fast meal or to take away, for example there’s a bakery that we sometimes grab something for breakfast on the train if we have a very early start. There’s an information booth with English speaking staff on the first level directly above the main atrium, just take the escalators up one level. They will be able to answer your questions and provide a free Kyoto map for you to explore the city. 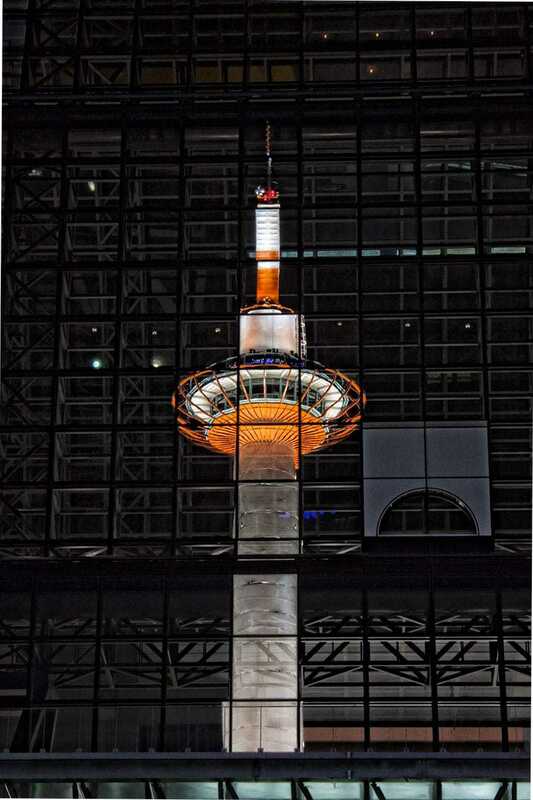 I am going to kyoto in 2 1/2 months and can’t wait, staying at hotel gravia for 4 nights since we are using the station as a base, then going to Hiroshima and okayama for a few days. My son is my tour guide since he lives in kuroyoshi for the past few years, which is good, got a seasoned japan traveler and he speaks Japanese too! ! Thanks Kathy. Have a wonderful time in Japan, what a bonus having your son able to travel with you and speak Japanese, you’ll get a lot of extra insights from that. The Granvia in Kyoto is great, we’ve stayed there 3 times now and would definitely go back, we only go somewhere else if it’s really peak season and they’ve hiked their rates up too much for our budget. Enjoy! On the day I arrived Kyoto Station in mid-December, there was a light snowfall, so it felt like White Christmas, punctuated with a flurry of Kimonos on the passengers getting off the trains. On the afternoon I was there, the effect was complete with a looping soundtrack of “All I Want for Christmas is You” playing throughout the place. I did notice, however, one aspect of the station’s architecture that seems wanting — in the main lobby where the Cube Shopping Mall is located, the structure doesn’t protect the interior from the chill outside, leaving a lot of visitors shuddering and rushing for the nearest coffee stand. Wow, what an interesting train station! It is quite modern. Great photos! I love train stations – but I’ve never seen a modern one that fancy! Looks like a great place to transfer with lots of food options. Love the lines of the building. Thanks for linking up to the #SundayTraveler! Have a great time Jan! I love Kyoto, hope you catch the lovely colours of koyo around the temples and parks. I didn’t realize how much we missed in Kyoto Station. We took the shinkasen from Nagoya and spent some time at the shops and restaurants. It was a bit overwhelming to have so many choices to eat. It is one of the best train stations we’ve been to. Beautiful photos! I loved the modernity and beauty of Kyoto’s train station. I’m with Michele, though. We got very turned around inside. Hi Sarah, yeah it’s a huge place, easy to get turned around and head out a different exit! My worst one for that is subways, I’m completely directionally challenged underground and a couple of times I got the right line but headed in the wrong direction. It’s a good excuse to explore though. 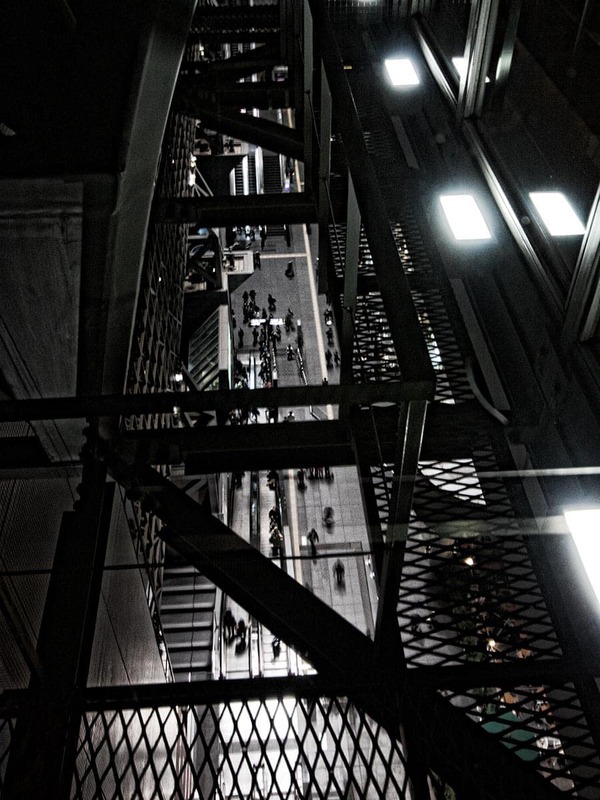 Train stations can be really interesting places, architecturally and really reflect a particular culture and aesthetic in a city’s development. This is a great series of posts! Its hard to think that this is a train station – sure beats any train stations I have ever been too! Thanks SJ, it really is the best I’ve seen, we think it’s better than a lot of airports around the world. I like your views of the station from up high. When we were there, we never got further than the main levels. Also, we always seemed to get turned around and somewhat lost inside. Lovely photos. Hi Michelle, it’s one of the biggest stations in Japan so it’s easy to end up lost until you work out your landmarks. Lots of reasons to get up high though, if not for the views then the multiple floors of restaurants – YUM! Wow this looks so cool! I really want to head over to Japan sometime this year. Thanks Richelle, it’s a great country that we keep going to back to and still have plenty of new spots on the wish list for our next trip. I hope you enjoy your visit!